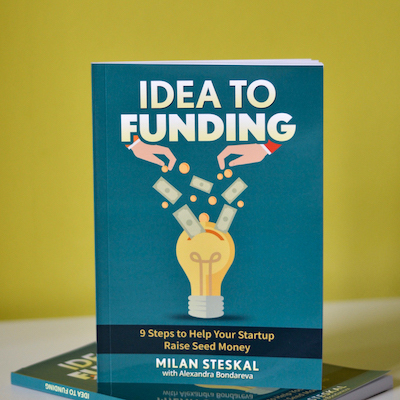 Do you have an idea for a startup and you want an investor? There are different fundraising options for different stages of an early stage startup and it’s good to go after the right ones. Before I explain the difference between them, I want to tell that the best source of funding are customers. That’s what I’d focus on if I were starting a new startup. Validating my ideas and getting some customers is much more important than attending meet ups and many conferences. Because when you manage to validate the problem, get some customers and then realize that you need more money, it will be much easier to fundraise. Here are the fundraising options for early stage startups. Think of a friend or an uncle who has a lot of money and can help you start working on your idea for a few months, so that you can, for example, pay the developer to build the prototype AFTER you validate the problem with the real potential customers. If you have such people around you, they will usually be the first ones you’ll talk about investment to. You can also practice your pitch for the other types of investors with them. Accelerators are for the earliest stage startups. When you have an idea and have done some basic validation, you can apply for an accelerator program. The biggest advantage is that they will provide you with mentoring and teach you what you should do, but usually provide some basic funding so you can afford to work on your idea full-time. Accelerators usually have quite a good network and can help you with introductions to your potential partners and customers. Angel investors usually help you when you aren’t ready for VC. So it means a very early stage when you have the prototype ready and have validated the problem and some of your assumptions. They invest less that VCs (but it also depends) and they may be more hands on. Many angel investors are entrepreneurs or former top managers who want to do something else. Often, they have more hands-on approach and also help you with what you need (introductions, mentoring, etc). They are institutional investors who invest someone else’s. They are the ones who you want for raising seed rounds and further. The amount for the particular round is different by the region. For example, a Series A round in Central Europe is approximately as much as a seed round in Silicon Valley. VCs are there to help you finish the product, build the team and grow. If you are starting a new startup and aren’t sure about what to do next let me know. I have open hours and do free startup consultations once a week.